Future Electronics of Tomorrow is a turnkey business, that will plan, pre-wire, sell and install all products for Home Theater, Computers, CCTV/Surveillance camera setups. Custom building and designing Home Theater and Surveillance setups based on your application. All around best experience for me. Shelby is a very smart man that knows what he is doing. He will be pre-wiring our new house by years' end. Shelby has done two installations for me in the past five years. I definitely will use him again. SHELBY HAS BEEN DOING WORK FOR MY FAMILY OVER TWO YEARS. HE KNOWS HIS BUSINESS, HE IS VERY POLITE, EASY TO BE AROUND, AND RETURNS YOUR PHONE CALLS. HE HAS EVEN HELPED ME WITH JUST PHONE CALL. SHELBY INSTALLED ALL OF OUR ELECTRICAL COMPONETS IN OUR HOME. TV, CD, DVD, COMPUTERS ETC. HE WILL BE WORKING AT MY HOME AGAIN IN A FEW DAYS. 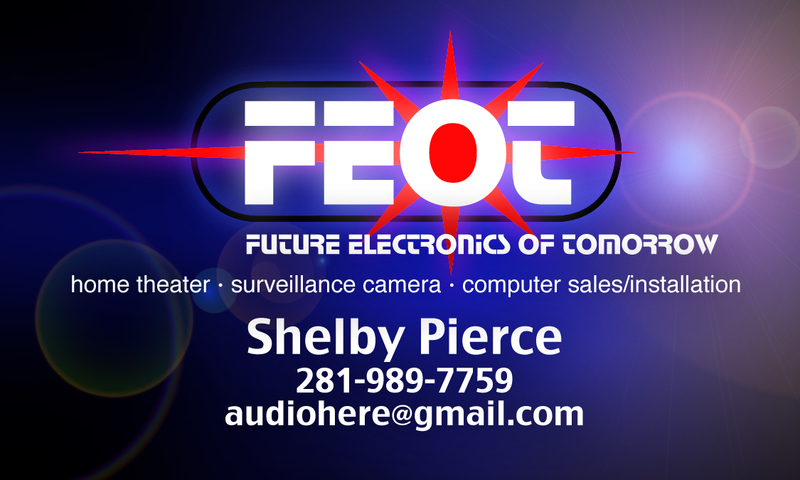 I HIGHLY RECOMMEND SHELBY PIERCE FOR HIS WORK AS AN ELECTRONIC TECHNITION AND HIS WORK INSTALLING AND TUNING ELECTRONIC EQUIPMENT. HE IS A PERSONABLE YOUNG MAN WHO PRIDES HIMSELF ON DOING A PROFFESIONAL TASK CARRING THROUGH TO COMPLETE SATISFACTION OF HIS CLIENT. I HAVE KNOWN SHELBY AND HAVE USED HIS SERVICES FOR SEVERAL YEAR AND COMMEND HIM FOR IS FAITHFUL AND COMPETENT SERVICE. CONTRACTOR WIRED OFFICE FOR NEW SYSTEM. HE DID A GOOD JOB. WILL CONTINUE TO USE HIM.